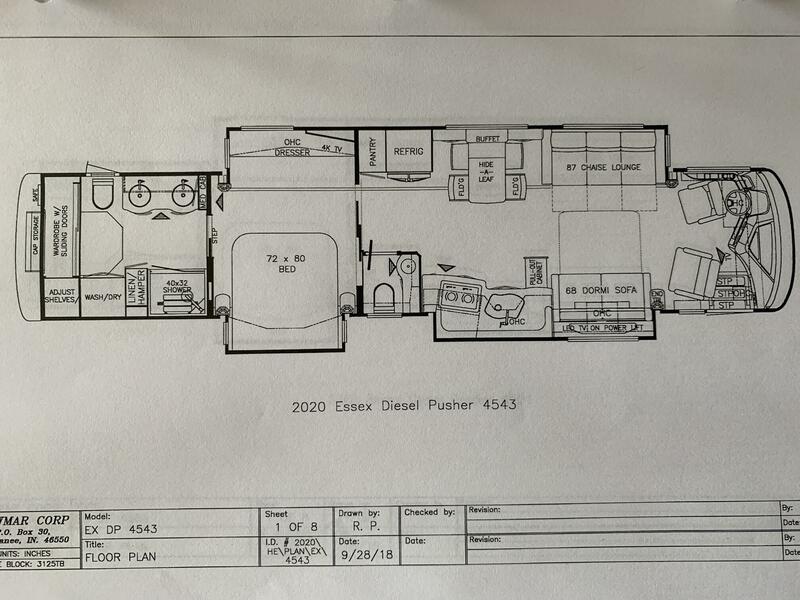 In all, there are 7 floor plans in the Essex line up for 2020. 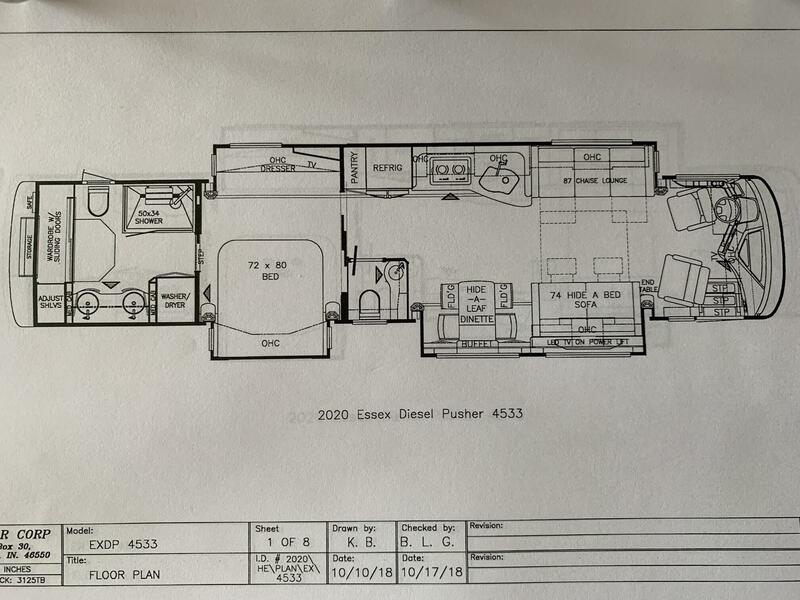 The Essex 4533, 4543, 4551, and 4579 floor plans have been carried over for 2020. The Essex 4534 (replaced with the new 4569), 4550 (replaced with the new 4559), 4576 and 4598 (replaced with the new 4578) have been discontinued. The 2020 Essex 4559, 4569 and 4578 are new models for 2020. 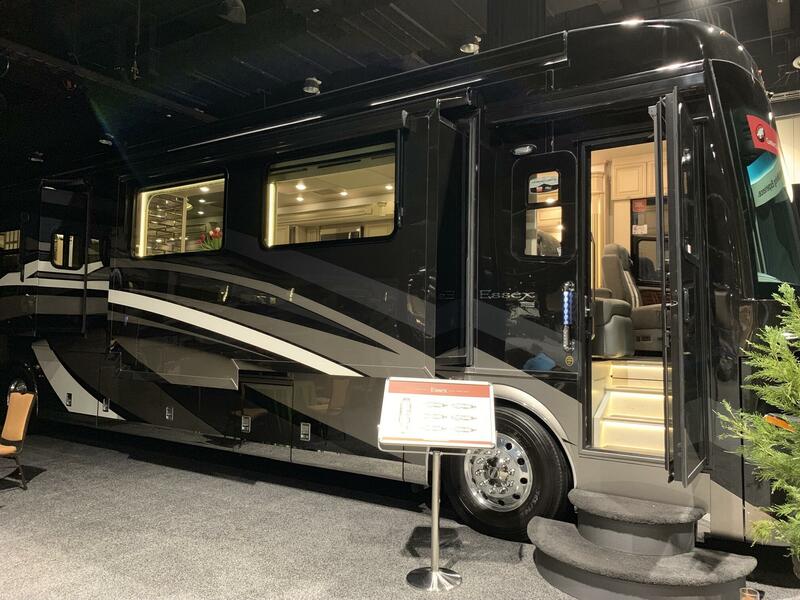 The new 2020 Essex 4559 is a quad slide with the bedroom in the back of the motor home. 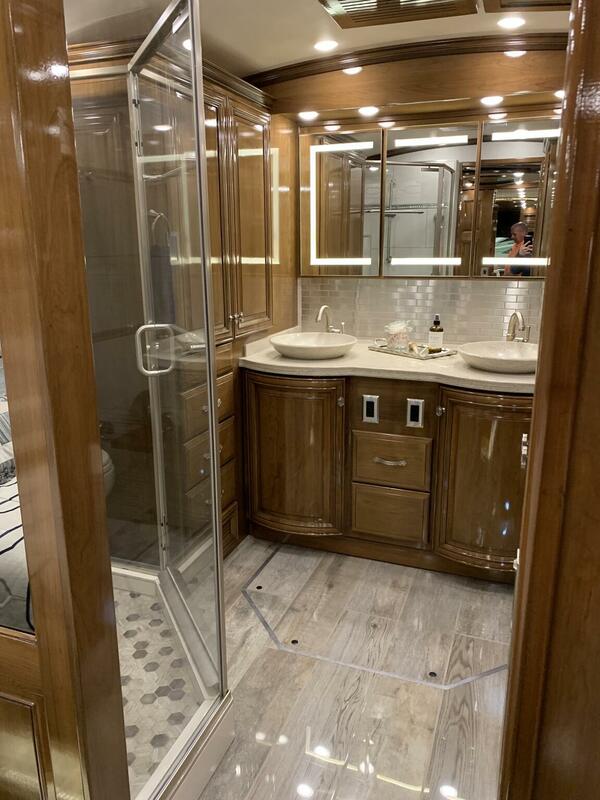 Mid-ship is a large walk through bathroom area with a large lighted vanity with his and hers sinks. There is also a private water closet with a 3rd sink that can be accessed either from the front living area or from the open bath area. The Essex 4569 is a modified version of the 2019 Essex 4534 model, which it replaces. The 4569 remains a bath and a half model with a full wall slide and U-shaped kitchen. Rear of the bedroom is the master bath which offers a 40” X 40” glass enclosed shower, washer & dryer, and a two sink vanity with two wardrobes, one on each side along the rear wall. The wardrobe on the door side of the rear master bath is larger in it was in the 4534 in 2019 in that it extends forward all the way to the shower wall. This provides more total storage space in the rear bath of the new 4569. 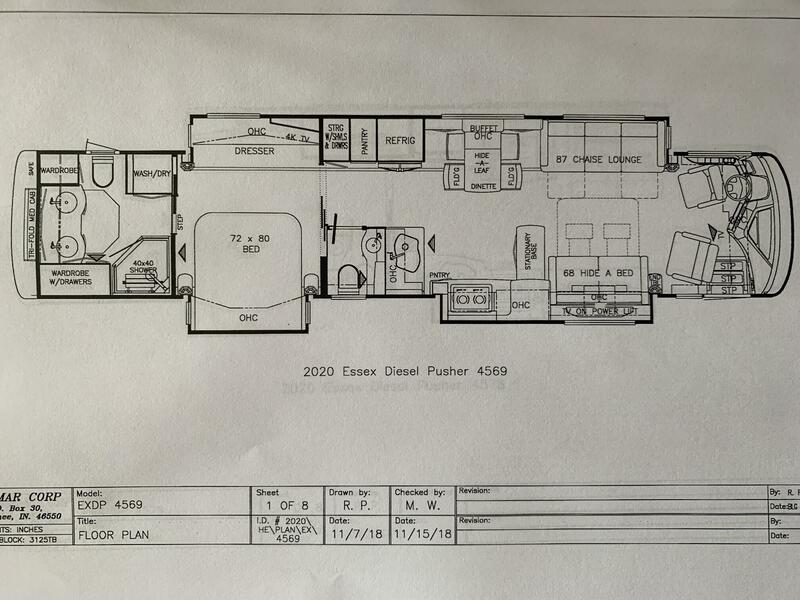 The new Essex 4578 floor plan is a full wall slide bath and a half bunk model. 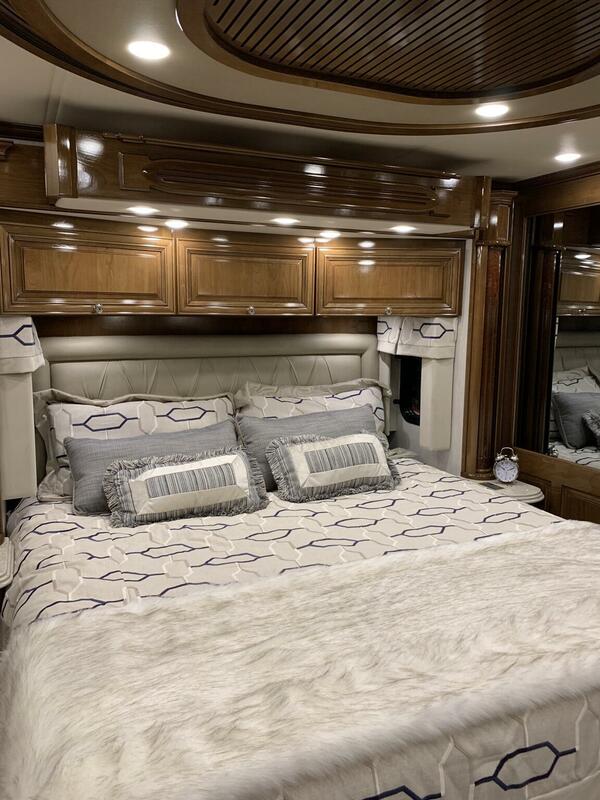 It replaces the 4598 bunk model offered by Newmar in 2019, which was a quad slide layout. 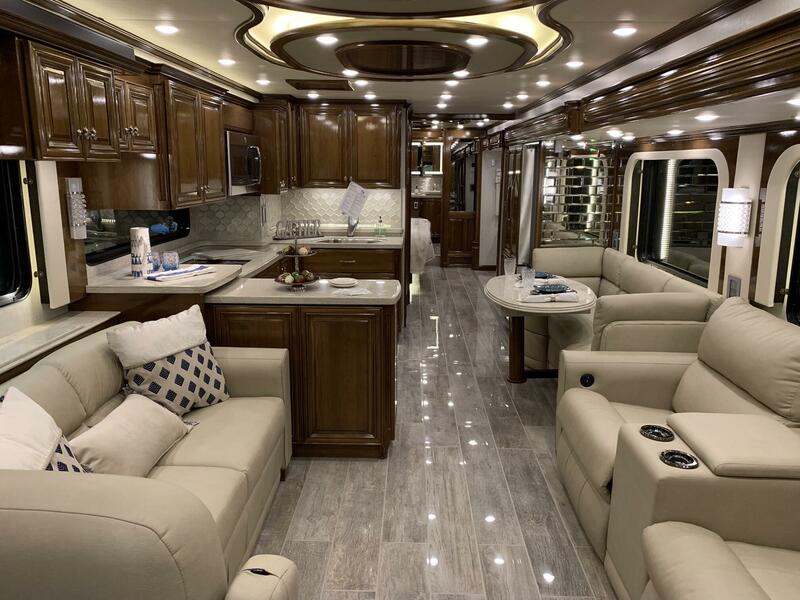 The front living area features a 68” jack-knife sofa with “televator” and hide-a-leaf dinette with chairs on the off door side. An opposing 74” dormi sofa and roomy kitchen with pull-out counter are located door side. 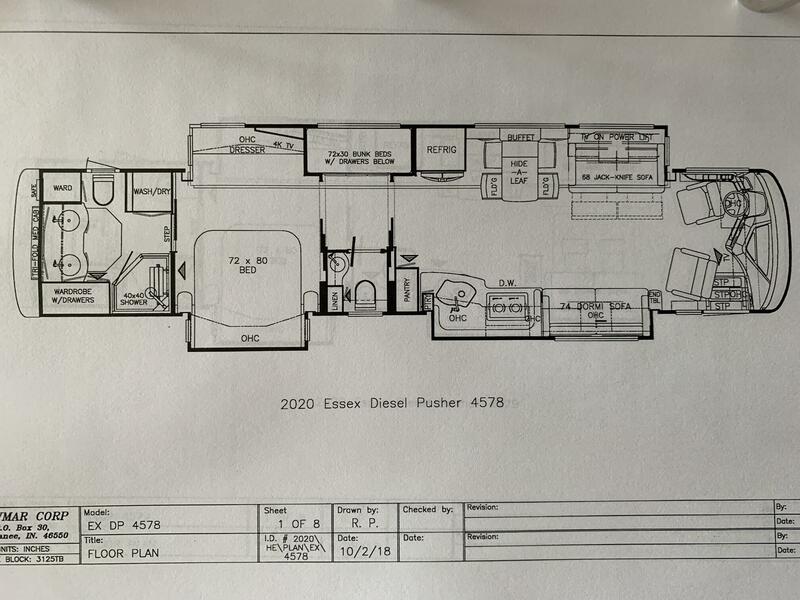 Mid-ship, the refrigerator is positioned on the off door side, with the half bath and pantry located on the door side. Rear of the bedroom is the master bath which offers a 40” X 40” glass enclosed shower, washer & dryer, and a two sink lighted vanity with two wardrobes, one on each side along the rear wall. The wardrobe on the door side of the rear master bath is large and extends forward all the way to the shower wall. The 2020 Essex will feature a JBL Slimline subwoofer that is more compact and easier to fit when installed under the dash area. Samsung replaces Sony brand televisions in Essex for 2020. The option for the Xite HD 360 camera system offered in 2019 is a standard feature in 2020 (used on 90% of all Essex orders in 2019). The Advantium Speedcook microwave with stainless steel finish is standard in the 2020 Essex. A new driver’s seat with vibration for haptic feedback is standard. This is because Mobile Eye lane tracking and departure warning system has been added to the 2020 Essex as a standard feature. Both, the driver and passenger seats of the Essex are air-cooled for the 2020 model year. 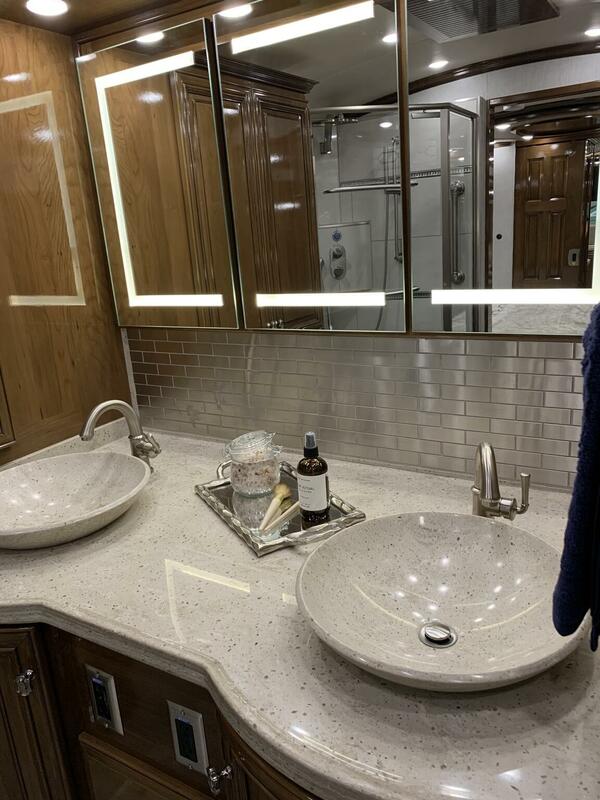 The soft close cabinet doors introduced in King Aire for 2019 are now a new highlight in the cabinetry of the 2020 Essex. 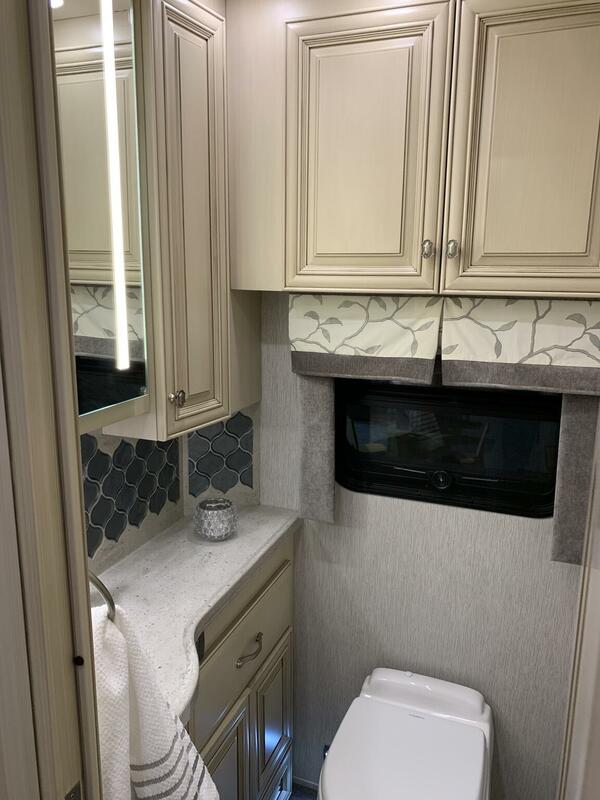 The cabinet door has a stainless steel trash can (changed to the same one used in King Aire in 2019), that is fastened to a drawer and pulls out as an assembly. This allows easy access to the trash can and drawer contents, and allows for sink cover storage for easier access. 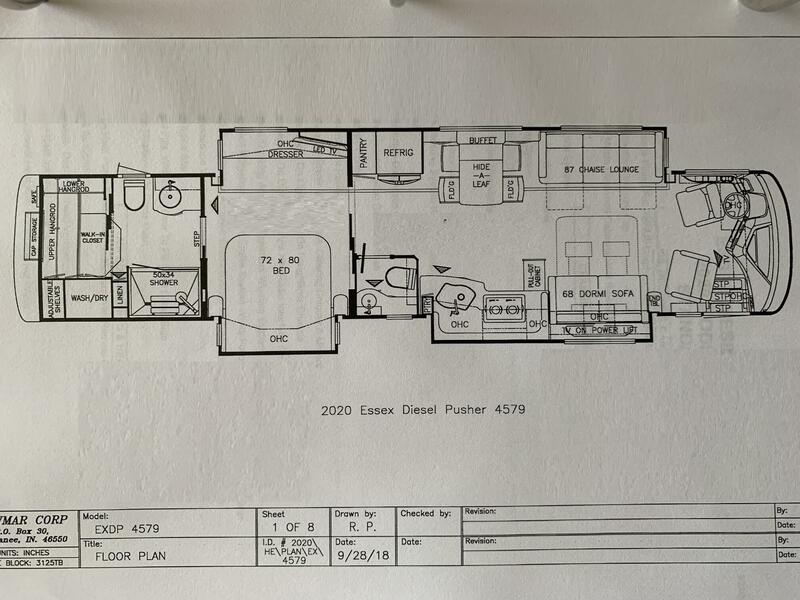 There are travel latches on the pantry doors of the 2020 Essex. In select floor plans, the master bathroom vanity cabinet base will feature tip out storage. The 2020 Essex will only be available on a Spartan chassis. There is no optional chassis for Essex in the 2020 model year. The dash HVAC system in the 2020 Essex will feature a fresh air filter and new controls for the dual zone climate control system. The Comfort Drive Steering control has been relocated to the steering wheel on the Spartan chassis. The Spartan chassis on the 2020 Essex will be equipped with 60 millimeter shocks to provide better ride quality. A new key fob programming switch, located under the access panel on top of the dash, is available on the Spartan chassis. This provides an easier way for a technician to program a new key fob for the keyless ignition system in the event a fob needs to be replaced. Mobile Eye lane tracking and departure warning system is standard equipment on the 2020 Essex. This new standard feature also provides automatically controlled high beam headlights that can be enabled and disabled by the driver. The OnGuard collision mitigation and adaptive cruise system that was optional on the 2019 Essex has been made standard for 2020. An electric switch has been added to the brake pedal for push button ignition of the 2020 Essex. The previous version was air pressure activated and did not allow the operator to start the motor home if there was not sufficient compressed air in the air system. The interior décor package in the 2020 Essex will feature new style wall sconces. A lighted mirror replaces vanity lights in the bath area. 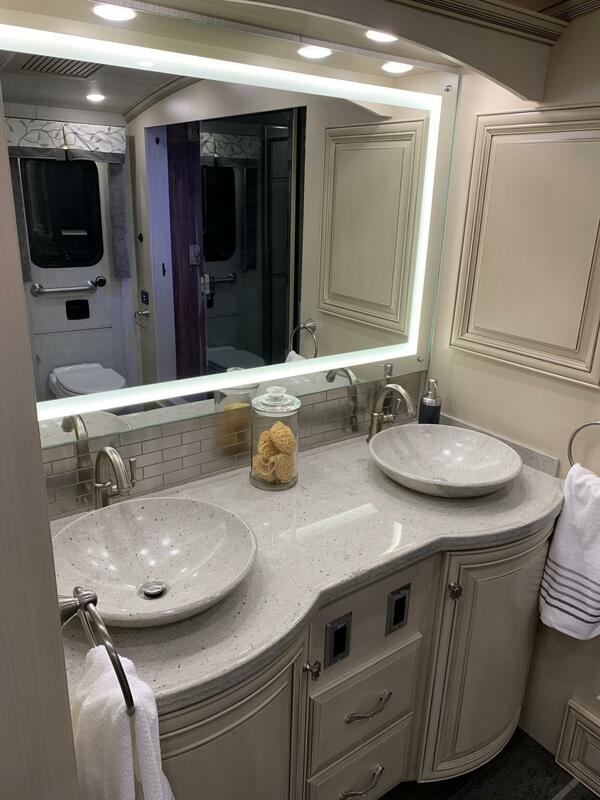 In addition, LED lights have been added in the ceiling over the vanity for additional light. A wireless cell phone charging pad has been added to the passenger console of the 2020 Essex. 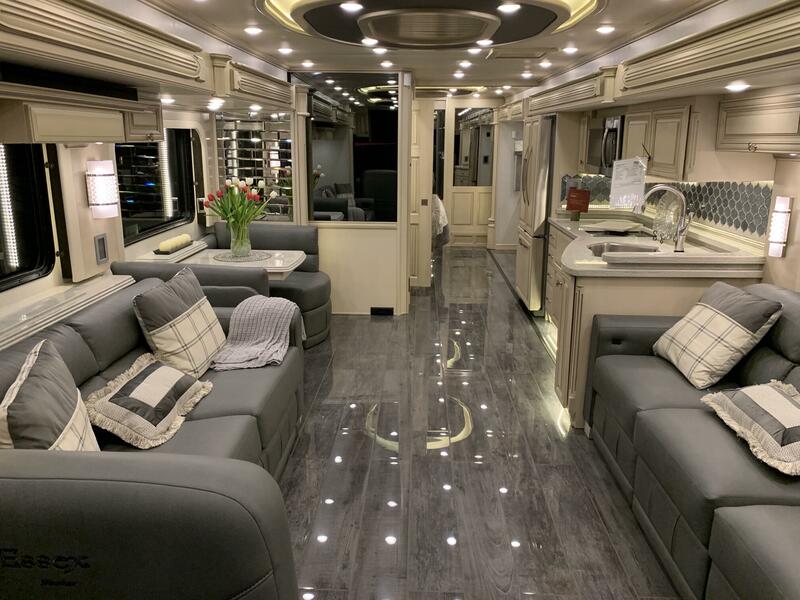 The 2020 Essex has a new Silverleaf display with larger screen. 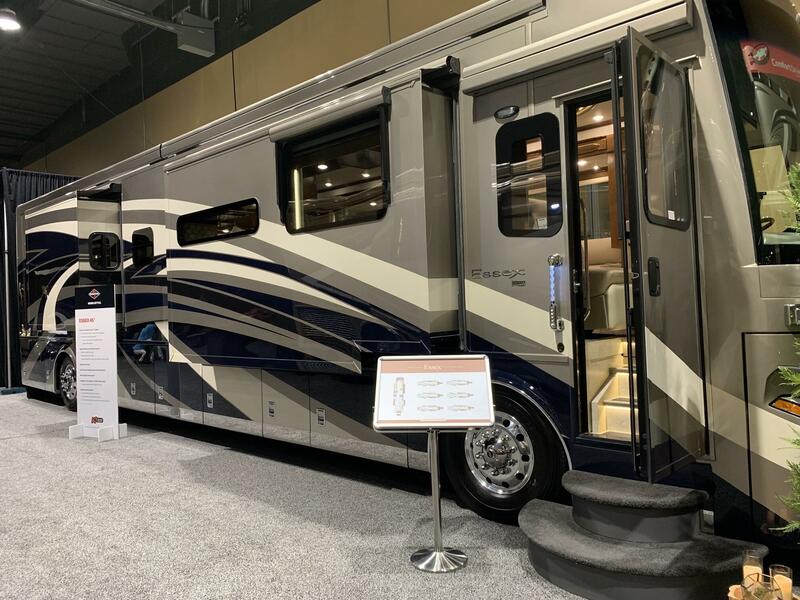 A lighted Newmar badge is a new addition and special highlight on the front bumper of the 2020 Essex. The 2020 Essex will feature new exterior graphic, paint colors, as well as large “fades” in the exterior paint finish. The latest version of the HWH entry step has been added to the 2020 Essex. The new design includes lights at each step, better wire routing that is well concealed, as well as a new ground contact switch along with other improvements. 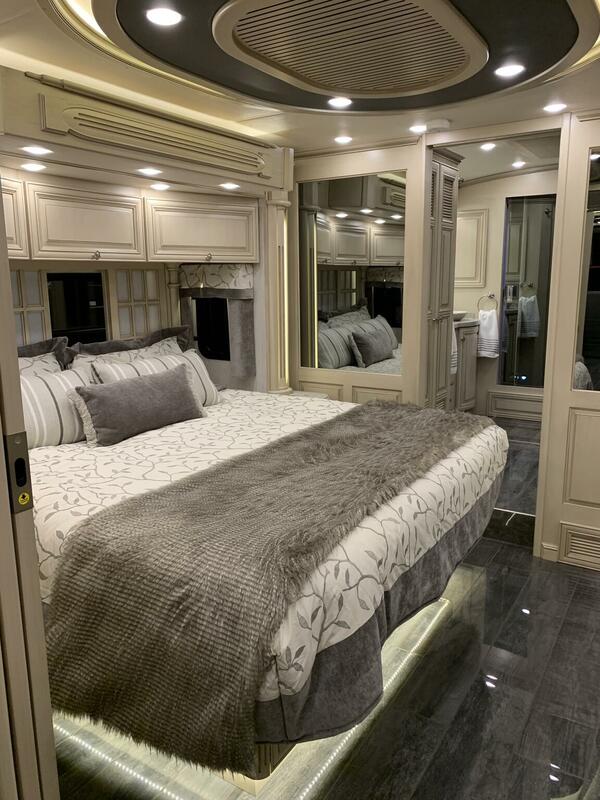 Some of the interior decors are new for the 2020 Essex. A newly designed accent wall feature will be a highlight in the front living area of the 2020 Essex. In select floor plans, the rear wardrobe in the bedroom of the 2020 Essex will feature larger shoe storage. 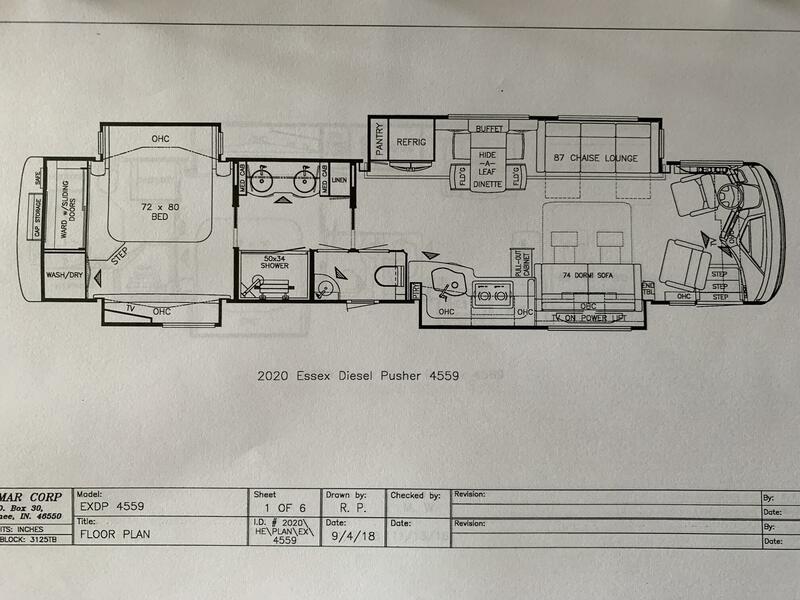 LED strip lighting above the kitchen slides (except for the 4533 model) will include lighting above the sofa and dinette areas. 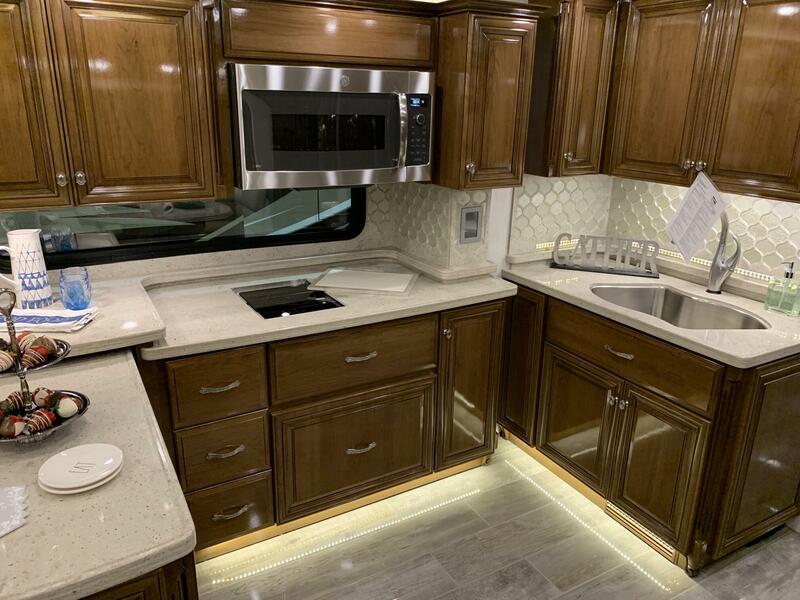 The kitchen of the 2020 Essex (where the optional kitchen window is not present) will feature a new concealed LED lights above to illuminate and highlight the inserts. A tiled foot prop has been added to the shower in the main bath of the 2020 Essex. The driver & passenger cup holders will be illuminated in the cockpit area of the 2020 Essex like they are in the 2019 King Aire. A new style of shower plumbing fixture is provided in the shower of the 2020 Essex. A towel bar is attached to the shower door glass. A new shower size (40” X 40” in dimension) is featured in the Essex 4569 and 4578 models. A universal toll module is a new option available on Essex for 2020. 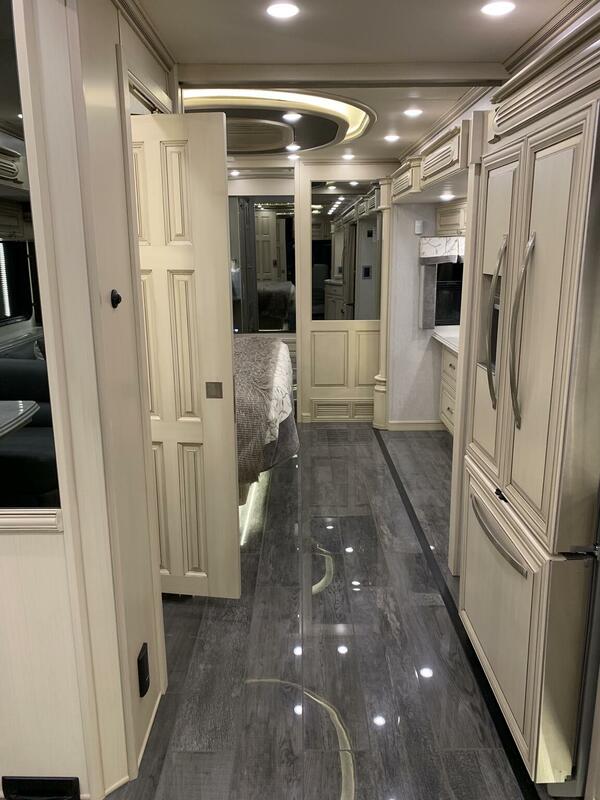 LED strip lighting under all slides on the off door side of the 2020 Essex is a new available option. 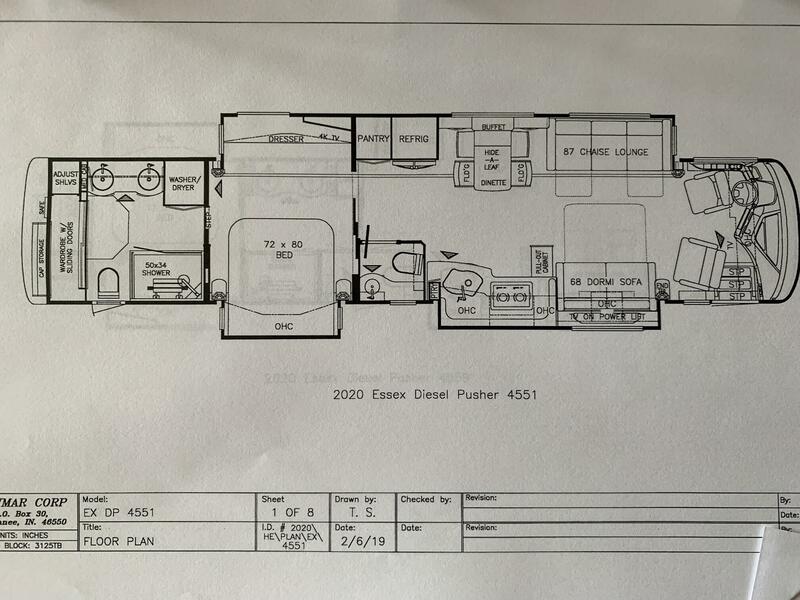 A Curt Spectrum brake controller is a new option on the 2020 Essex built on the optional Spartan chassis. This provides an auxiliary brake control system with the controls integrates into the instrument panel (rather than mounted under the dash when done after-market). This option is not available on the standard Freightliner chassis.